is a lecturer in the history of medicine and medical humanities at the University of Sheffield. He is the author of A History of Self-Harm in Britain: A Genealogy of Cutting and Overdosing (2015). Mothers have been the target of intense scrutiny and control throughout history. But during the 20th century this attention underwent a major shift. Motherhood was increasingly understood in medical, psychiatric and psychoanalytic terms, particularly in Britain and the United States. One of the most disturbing examples of this transition is the concept of Munchausen Syndrome by Proxy (MSbP). This is an extremely rare form of abuse in which a caregiver, usually a mother, fabricates illnesses for those in her care, often by inducing symptoms and interfering with test results. Now, MSbP’s classification as a psychiatric disorder is controversial. The Munchausen name has fallen out of favour, with many professionals preferring Fabricated or Induced Illness (FII). I should say straight away that I’m not claiming that MSbP is or is not real, or even weighing into that debate. What I’m arguing instead is that the history of MSbP shows how hypervigilance about motherhood creates the conditions in which medical and psychiatric phenomena can take root. It’s worth recapping some social history. In Britain, which is the focus of my research, concerns over children flourished after the First World War, and manifested in the growth of child guidance and social work. Professionals drew firm links between the domestic environment (long considered a ‘feminine sphere’), the quality of the mothering on offer, and the future prospects of children. Fathers weren’t exempt, but mothers bore the majority of the concern and criticism. Towering over mid-century discussions of motherhood is the figure of John Bowlby, a British psychoanalyst of children whose ideas on ‘attachment theory’ and ‘maternal deprivation’ became exceptionally influential. Bowlby waxed lyrical about the importance of a stable mother figure, arguing from research in foster homes that a life of instability, delinquency and psychological problems follow in the wake of inconsistent mothering. Bowlby followed other UK-based psychoanalysts such as Anna Freud and Melanie Klein in arguing that small children’s social relations are incredibly important, and disruption of mothering in the early years has wide-reaching psychic and social consequences. Note the double-edged sword of motherhood here. Attracting the praise of being a ‘good mother’ was always accompanied by the threat that you might fall from the perch at any moment and cause devastating harm to your child. Hence the amplification of mechanisms of control, censure and punishment that go hand in hand with the valorisation and surveillance of parenting. Deep within the medical and psychological frameworks promoting motherhood in this period, there lurks male anxiety over female power and influence. This concern played out over the question of how much time parents should spend at the hospital with their child. Until the middle of the 20th century, visits were strictly limited. Doctors and nurses protected the space and its routines, and limiting visitors helped to prevent the spread of infection: nurses helped with children’s ‘settling down’ after their mothers had left. However, Bowlby and certain social workers began to interpret this as a damaging form of psychic withdrawal, caused by the trauma of perceived abandonment. 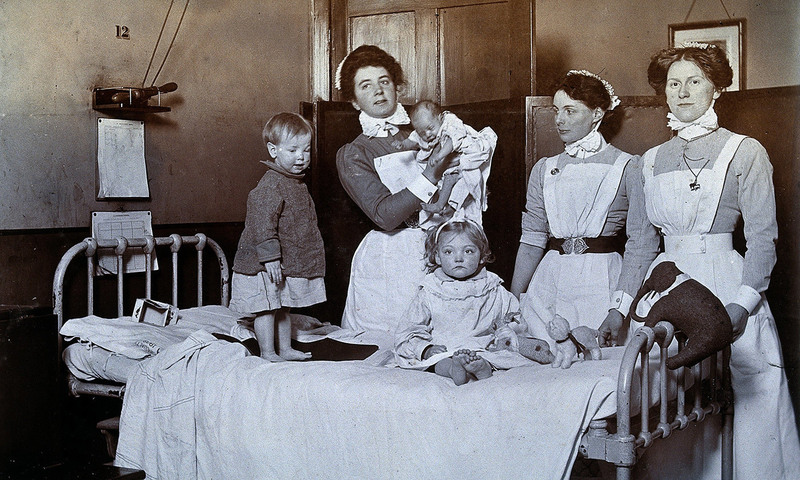 They recommended that visiting rules be relaxed in the case of parents of young children, and even that units be designed where mothers could ‘live in’ with their sick children. Experts began to champion the emotional support that mothers could give, over and above the concerns about spreading disease. Live-in accommodation and relaxed visiting regimes gradually (though unevenly) became accepted, especially in specialist children’s hospitals, such as Sheffield Children’s Hospital, or Great Ormond Street Hospital in London. Mothers and psychological health were inseparable; the accommodation of mothers and mothering as a key part of medical care became more and more commonplace. However, a new threat arose from these arrangements: MSbP. In 1977, the British paediatrician Roy Meadow published a paper in the Lancet describing two cases where mothers had fabricated or induced illness in their children. In one case, a six-year-old girl repeatedly presented at the hospital with bloody urine; in another, an infant was diagnosed as ‘failing to thrive’. In the former case the mother was discovered to have added her own blood to her daughter’s urine samples; in the latter, the boy died due to salt poisoning. Meadow named this phenomenon Munchausen Syndrome by Proxy – inspired by the original Munchausen syndrome, identified in 1951, which described repeated presentation at hospitals with tall tales and invented or induced symptoms. In MSbP, the deception of medical professionals takes place through a proxy, normally a dependent child. The mothers baffled Meadow. He reported that the two he had seen were pleasant and easy to deal with, and appreciative of the medical care their children received. But he inadvertently puts his finger on one of the important historical threads here. In the paper, he notes that it is ‘ironic to conjecture that the cause of both these children’s problems would have been discovered much sooner in the old days of restricted visiting hours and the absence of facilities for mothers to live in hospital with a sick child’. In the case of MSbP, the administrative and material changes in hospital practice that permitted mothering in hospital – and indeed promoted it as psychologically essential – were in fact implicated in the abuse. As Meadow said in his first large survey of MSbP cases in 1982, most of the mothers either lived in the hospital or visited it for long periods each day. These observations initially look like they are simply presented as evidence of the mothers’ duplicity and cunning – covering up their nefarious intent to harm, induce illness and fabricate symptoms. However, they also stand out because they point to the kind of extensive, almost continuous visiting that wouldn’t have been possible 20 years previously, and certainly wasn’t overwhelmingly common even in the 1980s. Because of their baffling symptoms, these children were often referred to specialist paediatric units where such live-in facilities were available. As Meadow later reported, these patients are placed ‘on a roller coaster of technological investigation in centres of excellence (always accompanied by their mothers)’. None of this should be read as putting Meadow on a diagnostic pedestal. He was struck off the register of medical practitioners in 2005 over faulty statistical evidence that he provided as expert witness in the trial of Sally Clark, who was accused of murdering two of her babies. After a successful appeal, Meadow was reinstated by the General Medical Council a year later, but then promptly retired and went into near-seclusion – his reputation never to recover. Feminists have long been aware of the risks of putting motherhood on a pedestal. In the case of MSbP, the belief in the importance of dedicated and conscientious caregiving was in fact what made it possible for the disorder to exist, and to attract so much scandalised attention. There’s no doubt that the amount of ink spilled over MSbP seems wildly out of proportion with the number of cases discovered. But what the story of MSbP reveals is the potency and perniciousness of norms around mothering, and how unpredictable their consequences are.